WASHINGTON (AllPolitics, July 22) -- As promised, President Bill Clinton signed legislation Wednesday aimed at changing the culture of the Internal Revenue Service and boosting taxpayers' rights in disputes with the much-hated agency. In a ceremony in the White House's East Room, Clinton said the IRS reform bill represents what can happen when bipartisanship takes over. "This bill shows what we can do when we work together, when we put the progress of America ahead of our partisan concerns, when we put our people over politics," Clinton said. 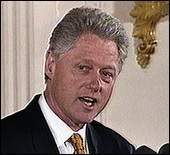 While the new law focuses on how the IRS does its work, not how much money it collects, Clinton also used the occasion to once again urge against across-the-board tax cuts before Congress and the White House figure out how to shore up the Social Security system against the anticipated onslaught of baby boomer retirees in the next decade. Clinton said he is not opposed to targeted tax cuts for child care, school construction or environmental protection, and noted he favored a plan to end the so-called "marriage tax" in the Senate tobacco legislation that collapsed. But Clinton said it would be wrong to spend federal budget surpluses, either on broad tax cuts or new government programs, before anyone knows how much it will cost to shore up Social Security. The president noted the U.S. is on the verge, after 29 years, of its first surplus. "After 29 years, it seems to me it's worth taking one year to address the challenge of fixing the Social Security system before we start spending the surplus on tax cuts or new spending programs, however worthy they might be," Clinton said. 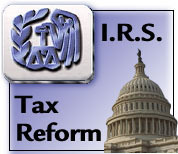 The "IRS Reconstruction and Reform Act of 1998" grew out of a series of Capitol Hill hearings featuring taxpayers' horror stories of their high-handed treatment by the agency. Earlier this summer, the measure cleared both houses of Congress by wide measures: 96-2 in the Senate and 402-8 in the House. Clinton not only had promised to sign it, but earlier this month, tried to keep hold of the issue for Democrats, saying the bill would help his efforts "to create an IRS that respects American taxpayers and respects their values." The burden of proof in civil court cases involving tax disputes would be shifted from the taxpayer to the IRS. The IRS must suspend penalties and interest if the agency waits more than 18 months to tell someone they owe additional taxes. People who face collection actions due to tax problems caused without their knowledge by spouses would be protected from some collection actions. A nine-member board with six private citizens to oversee the operations of the IRS. The IRS taxpayer advocate's office will have expanded powers to grant taxpayer assistance orders, which can halt tax collections in cases of hardship. While the bill has been politically popular in this election year, some say the reform measure will have little effect on most taxpayers. Only 4 to 5 million of the 212 million personal and business returns filed annually end up in dispute with the tax collection agency, according to Phil Brand, the IRS's former chief compliance officer. Over the next 10 years experts predict the reform measures will cost the IRS $12.9 billion, mostly in lost collections of taxes and penalties.